One of my staple Indian curries, Chicken Kadhai regularly features in almost all Indian meals I make; big or small. The key ingredient in this curry is the kasoori methi (dried fenugreek leaves) as it adds a distinct flavour that is both delicious and alluring. Although widely available from spice markets, kasoori methi isn’t a flavour many are accustomed to and makes a nice change from the typical curry flavours most people normally encounter. A personal favourite, to my mind this curry tastes and smells of India herself; a heady blend of fragrant spices, the earthy tones of the kasoori methi – all marry into a potent assault on the senses. 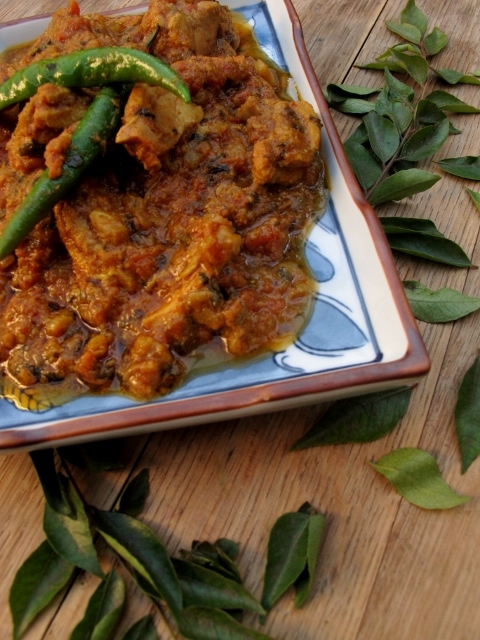 Just like India this curry will charm you, its flavours will linger and it will invariably leave you wanting more. Put the yogurt into a large bowl with the half the ginger and garlic (1 tsp. of each), mix together. Leave to marinate overnight in the fridge or for at least 3 hours. Heat the ghee/oil in a saucepan. Add the onions and sauté until golden brown, about 10 minutes. Be careful not to let the onions burn. Add the crushed chilli flakes and the remaining garlic/ginger pastes. Stir-fry for a minute. Add the ground turmeric and coriander, stir-fry for another 30 seconds. Add the tomatoes and cook for about 8 to 10 minutes or until the oil separates from the spice paste. This stage of the cooking process is vital, so take your time. Increase the heat to high and add the marinated chicken. Stir-fry for 5 minutes and then add the warm water and salt. Add the fenugreek leaves and garam masala. Bring to a boil and then reduce to a medium heat and simmer. Cook for 10 to 15 minutes, adding the whole green chillis a few minutes before the end of the cooking time.